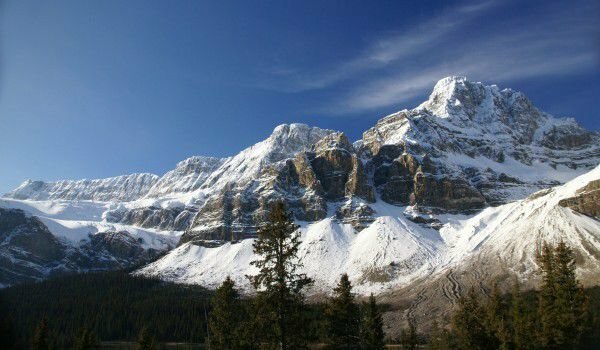 A journey through the majestic Canadian Rockies is one opportunity to touch some of the most ancient and beautiful natural spots of the formation of our planet. Within the Banff National Park, and Jasper National Park can be seen incredibly beautiful lakes, valleys, mountains, glaciers, waterfalls and more. The two parks in the Canadian province of Alberta are connected by Icefields Parkway, which is an unique in nature scenic route and one of the few that allow close contact with glaciers. Within Banff National Park one of the most majestic glacier formations is Crowfoot Glacier. More than 100 years ago, when it received this name, the glacier resembled a form of a crow's feet with three fingers. Over the past 50 years, the "third" finger of the crow is totally fallen off and is now barely visible. Glacier Crowfoot reaches a height of 3050 meters above sea level. Crowfoot Glacier rises into the eponymous mountain, south end of Bow Lake, which lies at the base of the mountain. The Glacier is located on the northeast slope of it, and 32 km northwest of Louise Lake. Crowfoot stands in the eastern continental watershed of Canada. The water of the glacier is the main source of Bow Lake. Formed at the end of the little Ice Age, Crowfoot glacier is gradually modified and today looks unlike the glacier, which more than one hundred years ago was baptized by researchers. With 1, 5 square miles, Crowfoot was once part of the Wapta Icefield, but in the 80s of last century has been identified as part of a small glacial system, covering about 5 square miles. The Glacier and Bow Lake are found 2068 m above sea level. Banff National Park itself is part of the World Cultural Heritage Sites by UNESCO. Interstate Icefields Parkway greatly facilitates access to the glacier, as the road reveals a detailed view of this magnificent natural wonder of ice. Crowfoot is a mandatory stop in the area of the park. Due to rapidly changing climate forecasts are not optimistic for the glacier and we do not know how long it will exist in its present form. The likelihood for Crowfoot to disappear soon is quite large. Although it remains without one of its parts, Crowfoot is still magnificent, with huge and breathtaking views. The beauty of the glacier, however, should not make you think it is safe – you are not allowed to climb on it. Icefields Parkway is also known as Highway 93 in Alberta. This is the main route to be followed to see all the natural attractions of Banff and Jasper parks. Particularly spectacular panorama opens during the winter months at Crowfoot. Furthermore, Lake Louise, and other beautiful places in the Canadian Rockies are lakes Pate and Hector, Sunwapta Falls, Athabasca Falls and within Jasper National Park, Punchbowl Falls must be seen, as is the Valley of Five Lakes.